Enjoy your beach vacation in this beautifully maintained home bordering on preservation land that offers privacy along with convenience. This professionally decorated jewel with over 35 windows and sliders provides an ideal vacation setting that is open, bright, and airy. A 6-foot fence offering both security and privacy surrounds the 35-foot pool and large hot tub. 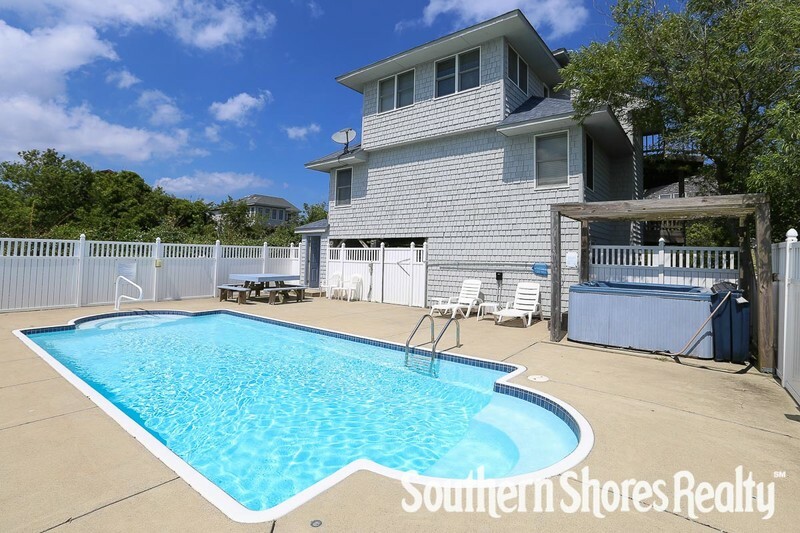 Fanned by refreshing breezes, the large pool deck, with its oversized picnic table, is an ideal place for sunbathing, entertaining or just relaxing. Just a short walk (355 yards) to the uncrowded beach, the Currituck Club golf course and to upscale shopping, community tennis plus your beds made with fresh linens. Laundry; cabana bath by pool. 4 bedrooms (1 with King and SATV shares bath (shower only) with 1 with Queen with SATV and DVD player, covered deck; 1 with 2 Bunk sets; 1 with Queen and SATV, covered deck; hall bath with tub and shower). Great room with horizon ocean view; large open decks with furniture, SATV/DVD player, stereo, dining area; breakfast nook, well-equipped kitchen; half bath on landing.